Photo courtesy of Visit Panama City Beach. Frank Brown Park is part of the City of Panama City Beach Parks and Recreation Department. Over 200 acres are dedicated to outdoor recreation facilities at neighborhood and community parks surrounding the beaches. The playgrounds, picnic area, saltwater fishing pier, freshwater youth fishing lake, green-ways and trails are open to the public year round. The Community Center and Senior Center hosts special events, civic club meetings and a variety of classes for all ages. 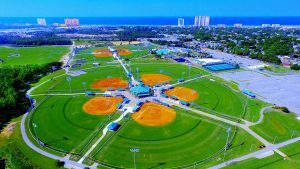 Frank Brown Park and Aaron Bessant Park have become the premier venue for events in Panama City Beach. The festival grounds in Frank Brown Park contain a 22-acre festival site with a 10,000+ person capacity. Frank Brown Park is home to many tournaments/events such as: Gulf Coast Jam, festivals, horse shows, car shows and more. The amphitheater at Aaron Bessant park can seat 7,500 people, and also has 10 acres of festival lawn. Current Frank Brown Park Facilities: 9 softball/baseball fields, 1 t-ball field, 1 miracle league Field, 3 soccer fields, 3 multi-purpose fields, 4 tennis courts, 2 outdoor basketball courts, 2 shuffle-board courts, 1 indoor gymnasium, 1 under the palms playground, 2 large picnic pavilions, 1 festival site, 1 freshwater youth fishing pond, 1.5 miles of greenways and trails, 2 fenced in dog play areas and 1 aquatic center. The Panama City Beach Aquatic Center is located in beautiful Frank Brown Park. The state of the art facility features a heated/cooled 50 meter Olympic Pool with a one meter springboard diving well and a seasonal 5,000 square-foot kids pool. A favorite destination for locals and tourists, the PCB Conservation Park offers opportunities for a variety of outdoor recreation. The City of Panama City Beach has established the Panama City Beach Conservation Park in cooperation with the Florida Department of Environmental Protection for the enjoyment of hikers, bikers and nature lovers. 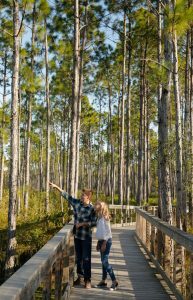 Encompassing over 2,900 acres, the Conservation Park has 24 miles of trails and over a mile of boardwalks that lead thru Cypress Domes. The trails range anywhere from 0.6 miles up to 11 miles, with 12 different trails to choose from. Parking and public restrooms are located at the Trail Head building along with picnic tables and a covered pavilion available for rent. Hours of operation are dawn to dusk, seven days a week. Be sure to bring your binoculars and cameras for bird and wildlife watching. Dogs are permitted, but must be kept on leashes. St. Andrews State Park is consistently one of the most visited state parks in Florida. The park is situated on a peninsula at the far eastern edge of Panama City Beach, and is bordered by the Gulf of Mexico to the south, the St. Andrews Pass to the east and the Grand Lagoon to the north. Visitors can go off road and explore trails with an amazing variety of wildlife or cast their lines from one of several exclusive piers. The park also offers biking, kayaking and shuttles to Shell Island. Brightly colored marine life can be found not far beneath the surface for snorkelers or scuba divers along the jetties. Swimming and surfing are popular on the Gulf side of the state park, while those in search of calmer waters enjoy the “kiddie pool,” a large area along the pass protected by the jetties. Campers can choose from 176 campsites with electricity, water, picnic tables and grills. The park is also a “primitive” camping area for scouts, faith-based groups, and other small, non-profit organized groups. This site is equipped with water, a portable toilet, fire ring and picnic tables. St. Andrews State Park offers two fishing piers, one (The Tiller Pier) on the Gulf Side, and the other fishing pier gives fishermen access to the protected waters of the Grand Lagoon. Fishing or walking on these piers is free, although there is a charge to enter the state park. A favorite spot for locals and visitors alike, Shell Island is an approximately 7-mile long undeveloped barrier island running east to west between the Gulf of Mexico and the St. Andrew Bay. Here you will find Florida at its most natural, where graceful sand dunes, coastal scrub forest, pine hammocks, and an inland lake provide the perfect home for deer, nesting shorebirds, and all manner of coastal creatures, including ghost crabs and endangered species such as Choctawhatchee Beach Mice, piping plovers, snowy plovers, as well as loggerhead and green sea turtles. Shell Island is a natural environment, which means there are no concession stands, no restroom facilities, and no picnic tables, trash receptacles or shaded pavilions. If you go, go prepared, and please take out everything you brought in. While Shell Island was named for the abundance of shells found here, in the more heavily trafficked parts of the island, shells are few and far between, since so many beachcombers are on the hunt for prize shells. Getting there: There are numerous tour boats that take passengers to Shell Island, including a Shell Island Shuttle that runs the short distance between mainland St. Andrews State Park and the island, and the PCB Shell Island Express Ferry from Capt. Anderson’s Marina. During peak summer season shuttles run 7 days a week. Off season schedules vary, so be sure to call ahead and check. 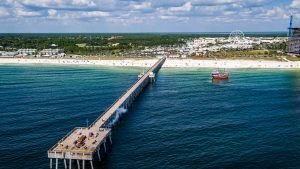 Panama City Beach offers fishermen four great fishing piers to choose from – three that reach far out into the Gulf of Mexico, and 1 that offers anglers a chance to cast their line into the Grand Lagoon. The two most prominent fishing piers in Panama City Beach are the identical Russell-Fields Pier and the M.B. Miller Pier, often referred to as the City Pier and the County Pier. Constructed within a year of each other (completed in 2009 and 2010), these two concrete piers are built to resist hurricane damage, and are the longest twin fishing piers on the Gulf of Mexico, stretching some 1,500 feet into excellent fishing grounds! Fish caught in season: Cobia, King Mackerel, Spanish Mackerel, Red fish, Blues, Blue liners, Pompano, Flounder, Hardtails and other varieties. Rod rentals, bait and tackle are available on site. In addition to fishermen, the piers are popular with spectators as well, who enjoy walking out over the water, witnessing some amazing catches, or just enjoying the unique view of the beach and the clear emerald waters swirling around the pilings of the piers. The cost to fish from either pier is $6. This price includes your daily fishing license, and discounts are available for seniors, military, and disabled persons. Children 6 years of age and under are free, and seasonal or annual passes are also available. Spectators to the Russell-Fields Pier pay $3 for a day pass, while the M.B. Miller Pier charges $2 per day for spectators. Passes purchased for one of these piers can be used at either. Bay County is famous for its waters and is the perfect place to find a fishing charter. The turquoise depths off our sandy shores are home to a vast array of wildlife. 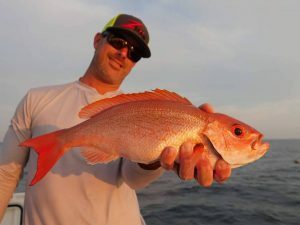 Whether you are interested in deep sea fishing in the Gulf of Mexico, or sitting on a pier in St. Andrew Bay, you’ll be delighted with the catch you reel in. Both novice anglers and old pros are sure to enjoy the salt and freshwater options in the region. No matter the size of your group or level of experience, Bay County has the right fishing charter boat for you. With an array of local companies to choose from, these professional guides have the expertise and gear you seek, and many can also provide fishing licenses. Take the hassle out of your vacation by leaving the planning to the experts who know the area and can lead you to the best results. Due to their decades of experience, chartering a fishing boat is the smart approach for a memorable day on the water and the catch to show for it. Are you planning to fly fish, spearfish or cast a wide net? Are you on the hunt for a prized trophy? Your family may enjoy the calmer waters of St. Andrew Bay, while the sportsman is best suited for the gulf. Bay County is visited by avid fishermen from all over the globe due to the variety of species and conditions available in one area. For instance, this is the place to be if you want to catch your own bait. 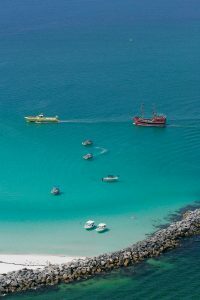 You can also enjoy bottom fishing around our natural and man-made reefs for fish such as Snapper, Groupers and Amberjack. If you are interested in trolling, you could catch anything from King Mackerel to Redfish to Bluefish. Fly fishermen head to the gulf for Spanish Mackerel or Cobia and to the bay for Ladyfish and Speckled Trout. Sports fishing is for those brave souls interested in bagging a Marlin, Tuna or even a shark! In Bay County, the fisherman is spoiled for choice. Beyond the types of fishing available, our range of fishing charters naturally includes a range of boats. There is something for everyone, with possible excursions ranging from a couple hours to a couple days. Do you picture yourself on an intimate vessel, with little separating you from the waves? Or are you seeking a luxury experience, perfect for a large group and days at sea? Whatever you want, we’re sure to have it. Boats can be found in a wide range of sizes and amenities. Most professional charter fishing companies will provide a fishing license for their customers. However, visitors can also obtain a short-term fishing license through the Florida Fish and Wildlife Conservation Commission. For more information, visit myfwc.com/license/. 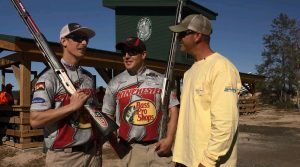 The Bay County Shooting Range features supervised rifle and handgun ranges, as well as sporting clays and 5-stand. The range was established in 2014 by Bay County to provide its citizens a place to gain skills and knowledge for safe, responsible firearms handling and target shooting. It was developed through the vision of the Bay County Board of County Commissioners. Contributing partners include the National Rifle Association and the FWC. Target frames on the rifle and handgun ranges are provided. Shooters must bring targets to attach to the center of the frames, or they can purchase targets in the concession store. 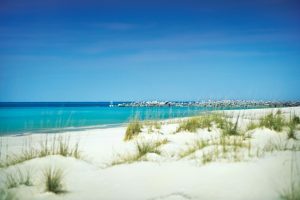 This often overlooked ecological gem sits on the far western border of Panama City Beach, just over the Phillips Inlet Bridge and close to the border of Walton County. 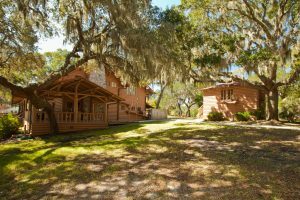 Offering pristine beaches, excellent trails that wind through dunes and scrub oak forests and a rare dune lake, Camp Helen State Park is truly one of Florida’s most special state parks. Camp Helen State Park is bordered by water on three sides, and the unique combination results in a fresh and saltwater mix, resulting in what’s known as “brackish” water. The park is home to five distinct natural communities including mesic flatwoods, scrub oak, basin swamp, depression marsh and marine unconsolidated substrate. There is no camping at Camp Helen State Park, but fishing, boating and fires are allowed in designated areas. 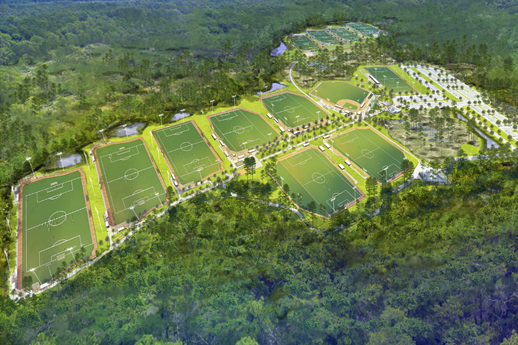 The Panama City Beach Sports Park and Stadium Complex is a flexible, multi-purpose design consisting of thirteen fields: eight rectangular fields for soccer, lacrosse, rugby, football and flag football, as well as five collegiate-sized baseball and softball fields with seating for up to 1,500 spectators. The first phase of the project builds on the variety of tournaments that Panama City Beach will be able to host, and enhances the destination’s appeal as a year-round destination. At build-out, the state-of-the-art project, located on 210-acres on the east end of Panama City Beach within the Breakfast Point development, will consist of the outdoor field complex, an indoor sports center and a new elementary school. The combination of high quality visitor amenities, state-of-the-art amateur athletic facilities and creative site design, will set a new standard for sports complexes throughout the country. For more information Bay County parks, contact the Bay County Parks and Recreation Division at (850) 784-4065 or visit their website by clicking here. 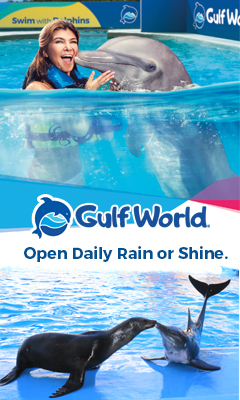 Click the button below and discover a wide variety of eco-tourism locations in Bay County.